“School of the Americas” by Bo Bartlett is included in the show at the Gibbes Museum. As the first anniversary of the shooting at Emanuel AME Church draws near, the Spoleto Festival and Gibbes Museum of Art are adding new voices to the conversation about the event. Debuting on May 28, “The Things We Carry: Contemporary Art in the South” had been in the works for some time, but had not advanced beyond tentative planning until last summer. The shooting of nine parishioners at the church last June influenced the decision to make 2016 the year for this exhibition’s debut, according to Curator of Exhibitions Pam Wall. The Gibbes has assembled a diverse group of artists who work in several types of media including paintings, sculpture, photography and mixed media. The show contains works by 11 artists, including American realist Bo Bartlett, photographer and multimedia artist William Christenberry, photographer Sally Mann and crafts and materials artist Sonya Clark. The works grapple with the complex legacy of the South. “We wanted to show the wide diversity of responses (to the shooting), as well as the diversity of artwork coming out of the South today,” Wall said. The Gibbes drew the artists from winners and finalists of its competitive 1858 Prize for Contemporary Southern Art. An annual competition, the seven-year-old 1858 Prize awards $10,000 to an artist whose work furthers understanding of Southern art. The award is sponsored through the members auxiliary group Society 1858. Mixed-media artist Stacy Lynn Waddell’s contribution to “The Things We Carry,” a 16-foot-long gold leaf diptych, deals directly with historical and contemporary meanings of guns in America. The Gibbes will also hang one of her pieces from their permanent collection in the show. “Manifest,” a series of images branded on to 60 paper sheets, references Waddell’s struggle with reconciling the loss of African culture in the United States with her own personal identity as an African-American artist. 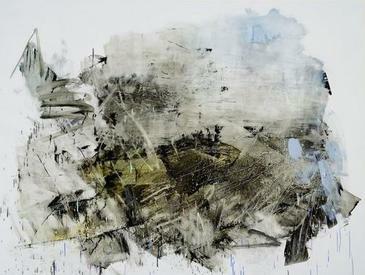 Three large-format paintings by North Carolinian artist Damian Stamer pose questions about time and memory on both a personal and regional scale. Revisiting places in which he played as a child, Stamer juxtaposes positive and negative aspects into his abstract artwork. WHERE: Gibbes Museum of Art, 135 Meeting St.